As I was walking to the library this morning, I was contemplating what to make for lunch, specifically wondering what kind of protein I could mix into my salad. It occurred to me that I had a bunch of crab-flavored surimi left over from the sushi I made this Shabbos. Score! I also had a serving or so of leftover pasta from yesterday (with roasted eggplant and diced tomatoes, no less!). 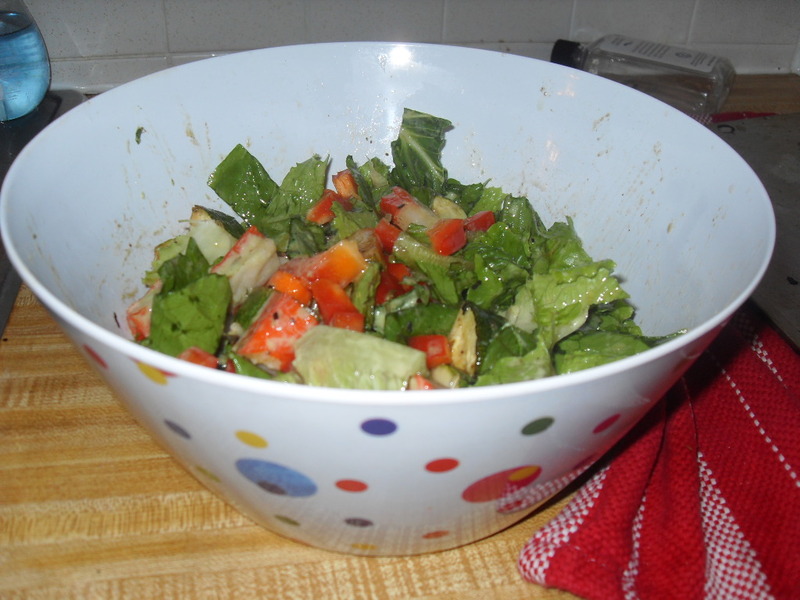 For the salad: I started with yummy Romaine lettuce. Then I chopped a red pepper and peeled and sliced a carrot. I cut up sixish of the surimi sticks. The kick, though, was a zuchini which I sliced, quartered and seasoned with sesame oil, rice vinegar, soy sauce, fennel seed, cardamom, cumin and celery seed and baked for 30 minutes on 350. I threw all this together and dressed with soy sauce, sesame oil, rice vinegar, wasabi sauce (with ginger), garlic powder and white pepper. Yum yum yummmmm.